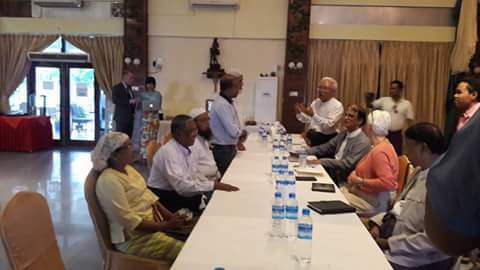 RANGOON – Seven members of the Kofi Annan-led Arakan State Advisory Commission canceled a visit to Maungdaw Township, citing concerns for their safety and then returning from the state capital of Sittwe to Rangoon on Thursday evening, according to commission member Al Haj U Aye Lwin. In a short phone interview with The Irrawaddy, U Aye Lwin said that the state government and the Burma Army had arranged for a helicopter to airlift the commission members to Maungdaw Township. The delegates, however, withdrew their plan due to instability on the ground. “We decided ourselves to cancel—it was not the state government,” U Aye Lwin said. The Irrawaddy attempted several times to contact other members of the commission, but they could not be reached at the time of publication. Arakan State government secretary U Tin Maung Swe confirmed that the advisory commission was headed to the Sittwe airport late on Thursday afternoon. He corroborated the statement by the commission members that the cancelation of the Maungdaw trip had not been at the government’s urging. On Monday, U Aye Lwin told The Irrawaddy that the commission intended to hold several meetings with religious and community leaders as well as to conduct a survey on the ground in Maungdaw Township to determine whether security forces had burned villages, as has been reported by international rights groups. They arrived in the state capital of Sittwe on Tuesday morning and conducted meetings with Buddhist and Muslim community leaders, gathering perspectives from both groups. On Wednesday morning, a joint team of border police and army members discovered an improvised explosive device on the road between Zin Paing Nyar and Nga Khu Ya villages in Maungdaw Township. The information committee for Arakan State, within the State Counselor’s Office, issued a report on Thursday citing further detentions of suspected militants by local authorities, saying that 59 people had been arrested from Kaung Taung, Gwa Son, Dar Gyi Sar villages during an army clearance operation carried out on the previous day. According to official government statistics, 10 border police were killed in attacks on outposts by militants on Oct. 9, and seven soldiers and 69 suspected militants were killed in the manhunt which followed. Around 279 suspects have been detained; 23 have been released and 29 have been sentenced to prison time for involvement in the border post attacks.